wearing a night sky while dancing the night away is in for summer and fall this year. Small star print showed up on the runways and has made its way into retail already for this season. Make the boys go starry eyed with these great finds. I love the midnight blue or black background found in most of this season's pieces. Use a bright, thin belt to accentuate the waist and add some color. 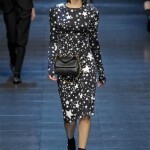 Dolce & Gabbana had stars in their eyes for their Fall 2011 collection like the dress seen to the left. I love the fitted silhouette and the pattern is fantastic.Look what PrivyDoll found to compete with this runway look. I love this one shoulder star printed dress from Delia*s. What a great budget buy! Asos doesn't let me down again when searching for the right off the runway trend look with a pricetag I love. Check out this fabulous star dress for $77.58. 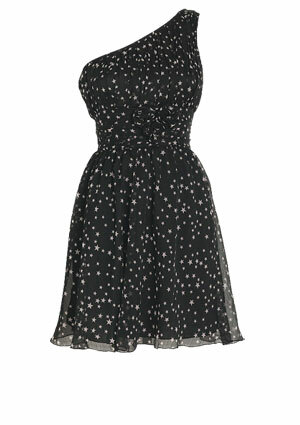 What a great star print dress with a retro feel from Shop Bop! On sale for $297 this is a great dress for work or play! I can see this with a great yellow or red shoe for contrast! 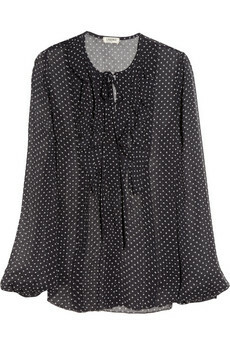 For a great work and drinks blouse, I love this one from L'Agence for $325 on Net-a-Porter. Love it with a skinny jean or pencil skirt!